So you learn something every day, and the other day I learned about a New Jersey death metal band called Grim Legion who were formed back in the late 80s and kept a fairly low profile through the dawn of the genre, until folding in the early 90s. Fast forward 20 years and they've returned at an appropriate moment: when nostalgia for death metal is an infectious high, and fandom is simply starved for the music that reminds them of Death, Autopsy, Obituary, Morbid Angel and other favorites along the Floridian axis of antiquity. 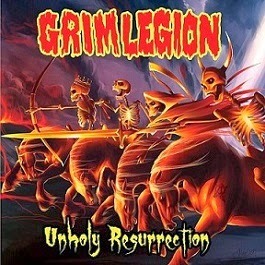 I promise you that Grim Legion does not surpass such comparisons (or expectations), nor do they wish to; but Unholy Resurrection, an album composed of older demo material refreshed into a full-length format, is incredibly fun regardless of how generic you might think it sounds after about 30 years of death metal. Hell, I even dug the comic book logo and the cover art which looks like it might have been an alternative cover for the old D&D Fiend Folio published way back in 1981. Cheesy to some, eye candy to others. Yeah, the late 80s sounds about right, Scream Bloody Gore meets Mental Funeral with a few traces of Altars of Madness for good measure, plus perhaps a little Cianide or Cancer. Definitely love this guitar tone, which is natural and noisy but possesses a pummeling saturation that doesn't rely too much on the worship of Swedish techniques. Bass lines are evil and bouncy, not often disparate from the rhythm guitars of tunes like "Necromajesty" or "Beyond the Grave", but always pumping like an oilrig. The vocals are just gruesome with character, a little bit of Chris Reifert or Killjoy in there but they also have some sinister sneers or baleful moans (like in the intro) to add a little variety and keep the record fresh. Riff construction might be construed as a little plain or ordinary considering just how many albums like this have come out across the decades, but remember that a lot of this was actually written during that primal dawning, and so that lends a little more legitimacy...to be accurate, the chord/grooves are more like Autopsy and the tremolo picked riffs and harmonies more akin to the first two Death records, and that right there will tell you whether or not this is something you're going to pick up. Personally, I've enjoyed spinning this a good half dozen times already, perhaps because it's an incredibly concise effort at 27 minutes and for some will feel more like an EP. They're wise to keep the material flashing between faster, aggressive rushes and mid-paced, murky breakdowns without often resorting to totally banal chugging or other tired tropes that just aren't very necessary. Even if the singer doesn't have the most unique chops in the field, he sounds about exactly how I'd want over material of this nature. Plenty of sustained growls that will shudder your nethers, and at times he almost sounds like a hoarser, beefier sibling to the late Chuck Schuldiner. Some will actually be thrilled to note that the blazing, atmospheric leads are provided by none other than John Paradiso of funeral doom gods Evoken, another well done component of this record that helps distinguish it from a disturbing number of throwback death metal bands that seem afraid to let those higher strings ring out in diabolic squeals. Anyway, it might be a little late to welcome Grim Legion back, since they've been reformed for a few years already, but this album really surprised me, because frankly I've been very jaded on the nostalgia trips of late and this one confirms to me that when it's done well, it still matters.